Recently, the Hog Roast Chigwell team were hired by Frances for her event Ascension Church. It was important that the service went to plan for the important occasion. She selected the Southern Slow Roast from the menu selection offered by the team and chose to serve the buffet on real crockery to give the event a slightly more luxurious feel. Frances chose to serve Cajun spiced whole chickens, fall off the bone Louisiana sticky ribs and Creole pulled quarter of spiced lamb. The meats were perfectly seasoned with an array of fantastic spices to give the meats a great kick. In addition, a fantastic selection of sides were prepared using fresh, local ingredients that were prepared on site. These included macaroni and cheese, Memphis style coleslaw, corn cobettes and Cajun spiced sweet potato wedges. For the vegetarian option, the Hog Roast Chigwell team crafted some vegetable skewers and some delicious homemade vegetarian lasagnes. The buffet was for 100 people and so it was important that the team started to make the food well in advance so that they had the time to ensure that all the meats were cooked to perfection when they served the food at 5pm. 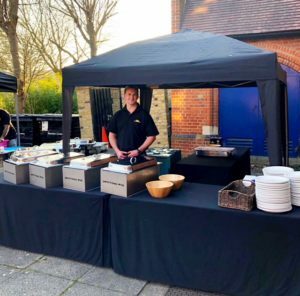 The food was prepared outside under the Hog Roast Chigwell’s marquee and the buffet was served along their buffet tables in professional metal serving dishes to ensure that the food stayed hot. The service was led by the Hog Roast team’s Catering Manager, Jean-Paul, who was delighted with the fantastic buffet that he helped his team to create. He was also really pleased with the effort his team had put into the service as they all brought their friendly faces with them and served all the food with a smile to the guests. In addition, the service ran really smoothly and the team encountered no hiccups while cooking the food. All the meat was tender and all of the sides perfectly complemented the meats that made up the centrepieces of the buffet. Moreover, the guests really enjoyed the food and many returned for second helpings once they had tried the great food. Sports Try Outs with A Hog Roast Kelvedon!